The Envato Network is a great marketplace known by huge numbers of people. This December you can grab the December’s Free File of the Month which is designed by DeltaForce. The free file includes a stylish and clean set of modern backgrounds. 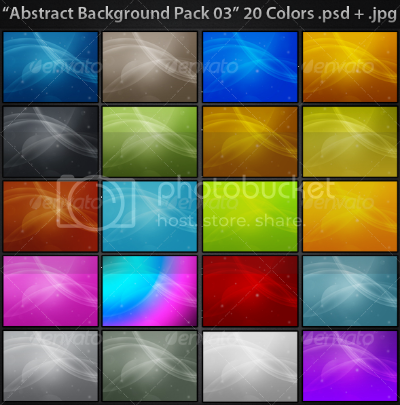 There are 20 super amazing nice abstract backgrounds with high resolution (4000×3000 pixels). 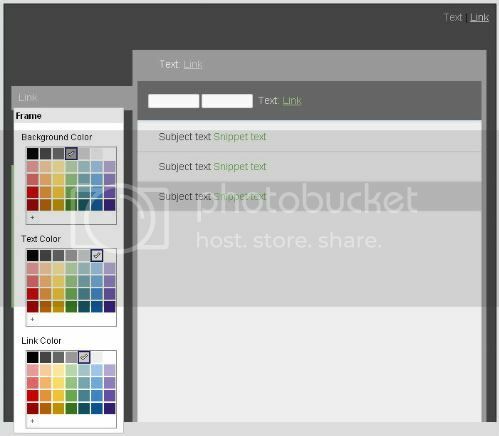 Enjoy and find it useful for your commercial or non-commercial but you may not use the file in multiple projects unless you purchase licenses. A month ago, I was working on a brand identity project together with Daniel Keller. He is a music producer, blogger & audiogadget lover from Switzerland, who is also the owner of this project :D. I'm so happy that after long brainstorming process, the re-brand of Danielku logo is finally here. 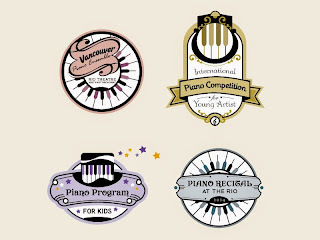 The idea was to bring a simple logo that correlates to Danielku slogan: "Music in Colors". As a start we think of a colorful music note. There were some facts to develop the basic concept into raw sketches: Daniel loves house/electro/dance musics and he produces music with drumpads. We tried to deliver the design concept with different arrangement of type, slogan text and the illustration part of the logo. Nevertheless, the music note could be very much closer to the basic idea compared to all which had been brought on using raw sketches. So we were focusing more to it. We made some alternatives for the head, stem and the flag of the music note. Some questions noted, such as: how the color would be shown on the music note's head? Should the music note be better appearing in Y axis or arranged diagonally? Where is to put the music note? The right proportion of it? We were also experimenting with the current logo trends: 'varidots', sequential layer of shapes, and also mosaic technique. In the next stage, we went back to the main root, and start thinking about another possibility to combine the colored music note idea with the electro music vibes concept. It could be colorful, and playful at the same time. "Tetris" game was the great inspiration as it represents the digital lifestyle. Daniel gave a helpful feedback at this stage, that a colorful pixelated music is a great descriptive concept to develop, simple illustration and we've been hoping this concept can also be flexible to deliver its visual message behind the brand attributes. This stage was a bit tricky. We tried to use several fonts and the colors for the texts as well. I designed a set of custom vector font for this logo by the way. But for technical reason, we have dropped the design and we decided to use Advent Bold for the main text and Advent Regular for the slogan text. The refining process didn't take too much time. Because the logo stays simple from the beginning. The important part is to make this logo works good in all kinds of media (web & print) and in black/white version. If you want to see some more details about the Danielku logo, and with better presentation graphics of course. You can visit my Behance portfolio page. Recently we've made another version to fit the 'ActiveDen' marketplace environment. We selected two font characters that can symbolized Flash ActionScript, which are 'd' and '<' ~ so both characters create Daniel's initial. But we are here not only to talk about how energizing to have few cups of coffee in your daily creative activities, because I also wanna share 10 color palettes from COLOURlovers ... and it's Coffee Time! Hello! I come back again with another Free Design Box files. 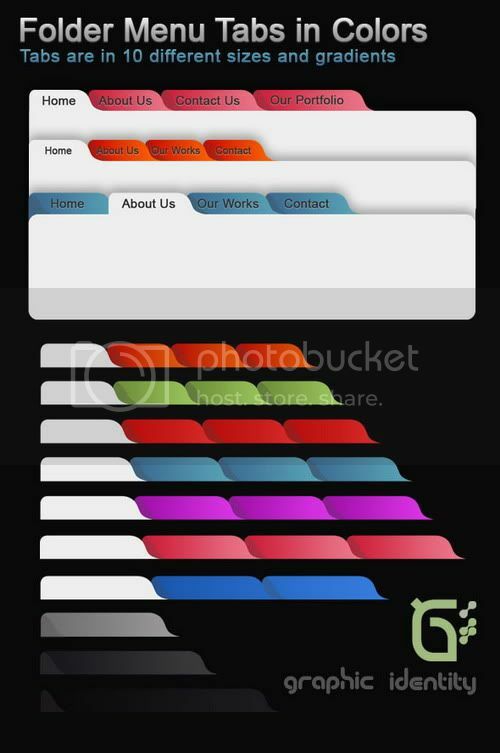 A set of Folder Menu Tabs in PSD file format. 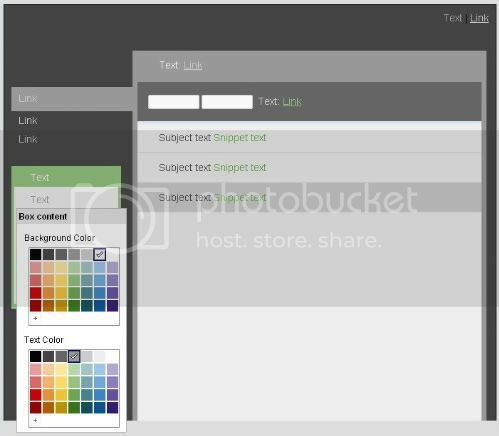 The set includes 10 different sizes and 10 gradient variations menu tabs. 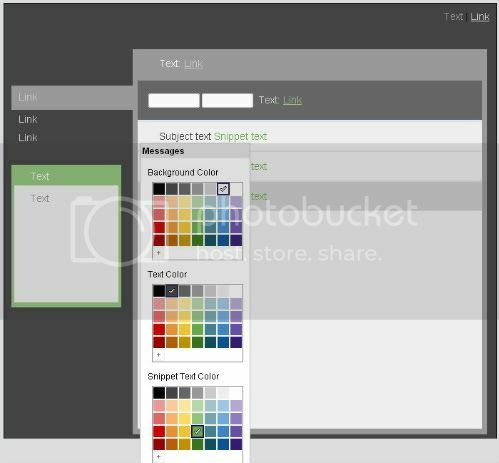 They are sleek, and there's a shading effect layer for each tab. 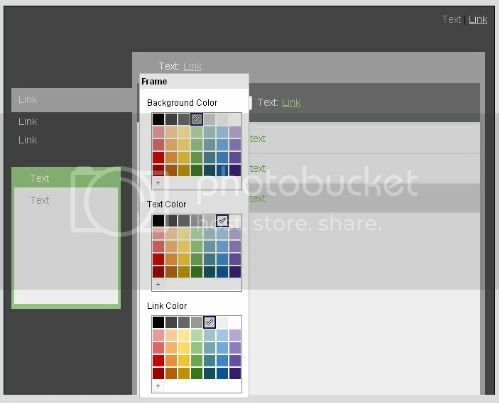 You will have multi-layered and well arranged menu tab vector shapes based on color choices. 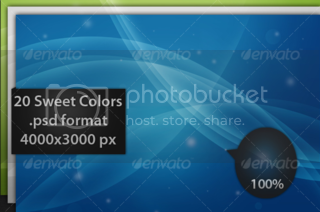 PSD file example (demo) to use the folder-like menu tabs is also available. Therefore you can set a box under the default state of it, along with the shading shape for each tab. I use Arial font for the demo file. All of Graphic Identity's 'Free Design Box' files are FREE (for personal or commercial use). But please read: Legal Usage to employ Graphic Identity's 'Free Design Box' files before you decide to download the files. 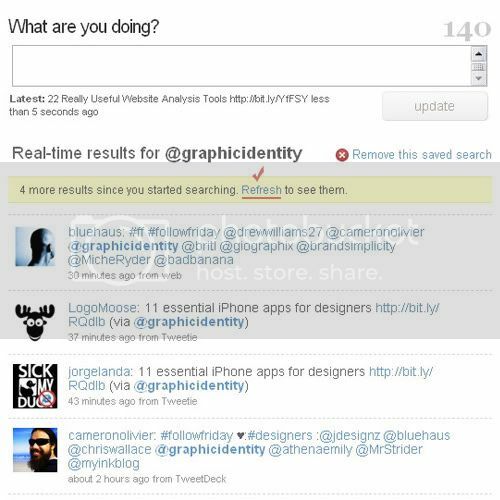 Just few weeks ago, I added a TweetMeme Button to Graphic Identity Blog post. As you know already, that Twitter has became a big community to exchange links about latest news, pictures, blip of songs, and of course a blog post. These exchange is made happened by some ReTweet actions chain. If you have a particular blog and you are familiar enough with this ReTweet term (or you can make it short as "RT"), then you may want to know about how to add a TweetMeme ReTweet Button to your blog post. It will track the number of RTs made for each blog post. Actually the instruction to install the TweetMeme Button is clearly stated on Tweetmeme Help page. But I just want to let you know that I've combined several codes all together, so you will know that it is a fully customized TweetMeme RT button. First of all, let's try to understand some options that make TweetMeme button as a smart RT add on for you blog. By default the RT button will direct you in the format of "RT [@tweetmeme] [blog post title] [link]". If you want to see different format as if the RT comes after you, just change 'talktweetmeme' with your own Twitter username. This is pretty good because not only your blog post is spread out via RTs chain, but the other Twitter users can check your Twitter profile when someone RT your blog post and probably become your new follower :). Wordpress CMS users won't find any difficulties with coding to install this add on, because TweetMeme has provided a TweetMeme Button Wordpress plugin. 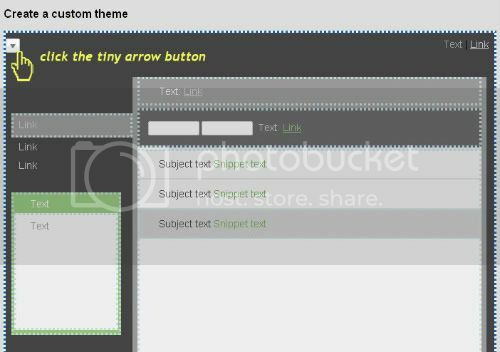 The last options to complete the customization steps could be the button styling. Some of you may like a compact button. For that you just need to include the code above. Don't include this code if you want more bigger button. 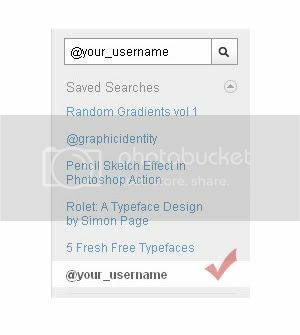 Here is another tutorial, written by AllBlogTools.com to style your TweetMeme button if you are a New Blogger Blogspot user. 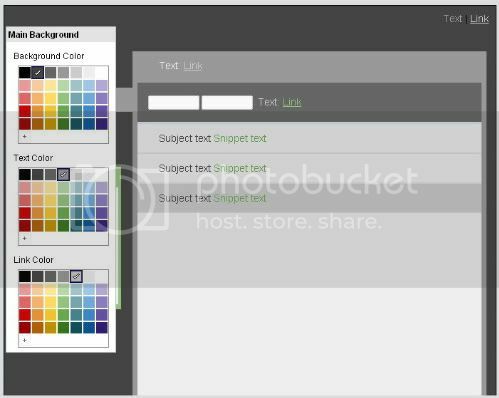 If you wanna know where your TweetMeme code is supposed to be added in New Blogger Template? Just visit this Anshul Dudeja's tutorial post to find out. I hope you will find this tutorial useful and a RT is much appreciated! ;) Have a lovely weekend everyone! 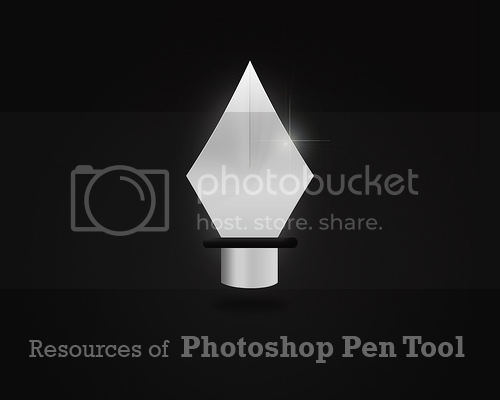 Pen Tool is a powerful tool in Photoshop that every designer should master. It is not difficult to understand how this tool work, but it would challenge most of us in its practical uses. Here are some resources links that may help you to figure out some Pen Tool tricks and its best practices for your creative design. A simple PDF file cheatsheet that shows how easy Adobe’s Pen Tool to be used across Photoshop, Illustrator and InDesign (CS2/CS3) . A very quick tutorial for pathing out a simple object from its background. A very comprehensive tutorial that has many visual examples, tips, best practices and instructions about Pen Tool. You'll find explanations of functions, keyboard shortcuts, cursors, mouse & keyboard controls and option to use Pen Tool. The tutorial also provides you the downloadable Pen Tool Exercise file so you can follow the guides to create precise paths, using the hints and shortcuts covered in this article. It is a well explained basic Peen Tool tutorial. The tutorial shows you how to create simple shapes with the help of Grid and snapping in your work canvas. In the end you'll learn how to cut out an image with the pen tool and then creating custom shapes from the work path. I've been using "Shiny" theme for months. 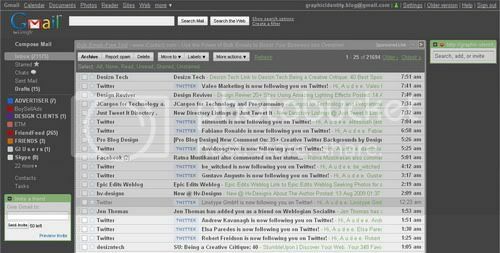 It is a theme provided in Gmail theme settings, which has glossy Web 2.0 style design in every corner of it. 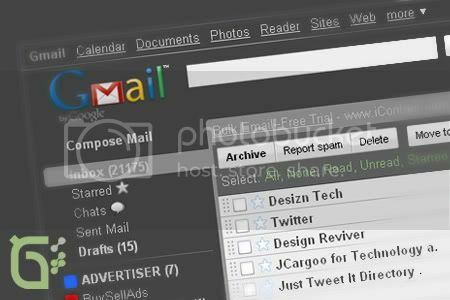 But then I want to see something different, because I always checking my Gmail everytime I'm online, I thought it would be a great idea to create my own Gmail theme in simplified look. I wanted to have custom Gmail theme that has similar color schemes as my Twitter background. 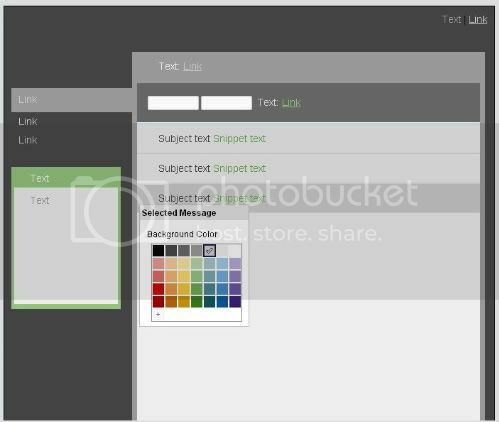 A Dark grey-scale theme with soft green color in some parts. When you hover on some parts of Gmail section boxes with your mouse, you'll see a tiny button in every corner of each box. 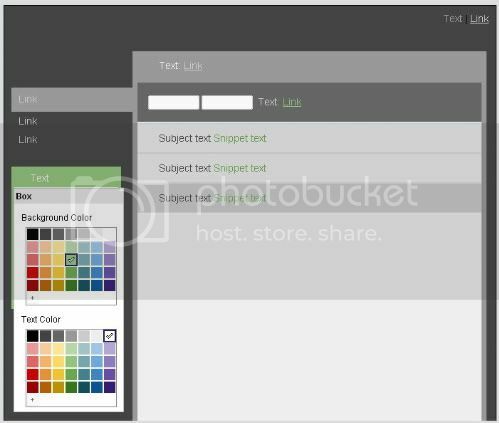 Click the tiny arrow so you can see the Color pickers in a drop-down tray. Click on the image to make it larger! I assume you've registered to Twitter, and please do sign up if you haven't. 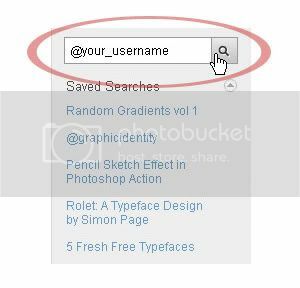 Once you're logged in, find the search box on the right sidebar and type your username after the "@" character. 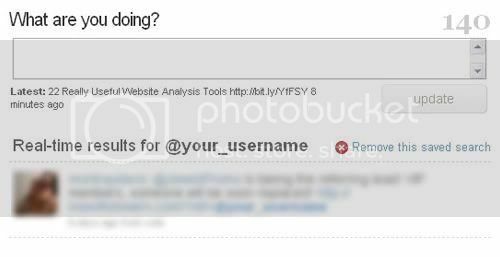 For an easy example, I'm gonna use this query: @your_username. Save the search query by clicking the green button on the top of your tweets updates section. 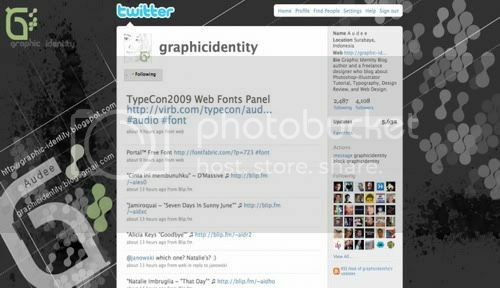 Twitter will confirm this and you can also check your Saved Searches section at Twiter web sidebar to make sure that you have saved your search query using your own Twitter username. You can remove this saved search later if you don't need it anymore. 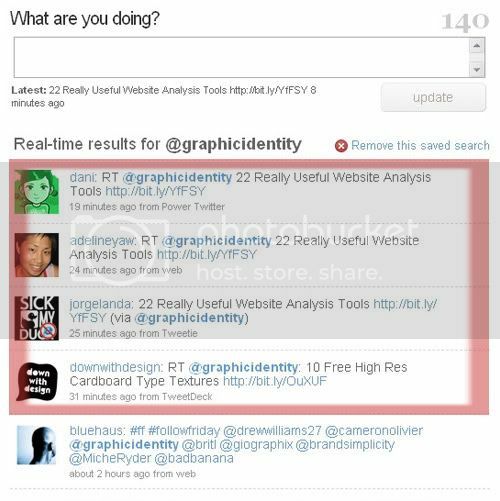 I only just click the "Refresh" link (you see I have 4 new replies right there) and there it goes, Twitter web will show the real-time replies of @graphicidentity. Keep your window browser active and Twitter will generate numbers of real-time results whenever there are any new updates coming up. Trending Topics seemed having better example to understand how this thing works, as you'll see the number of real-time results keep growing and growing within secs. 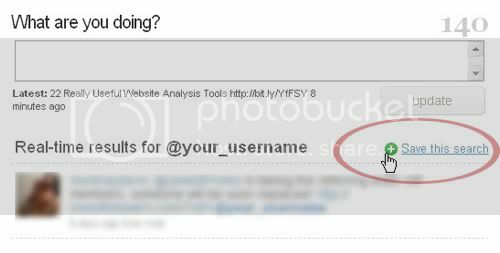 I also use Twitter real-time search result to find out how many Twepls who has tweeted my latest blog post. I included my blog post title on my saved searches for this. You can also do the same thing for any search queries to track them just in case you want to get fresh news, trending topics, tweeted conversations, hashtags or to follow your most favorite Twitter mate's latest tweets if you need. 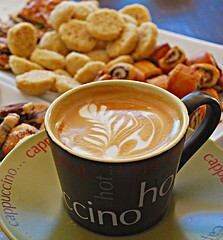 Have fun to explore this new Twitter feature and have a great weekend everyone!